Aubergines are at their best at the start of summer. Monica explains why she’s a big fan of this vibrant purple vegetable and shares a recipe for a beautiful roasted aubergine and tahini dip. With the coming and going of solstice last Friday, it feels like summer has finally arrived, and so too has one of my favourite vegetables: the wondrous purple aubergine. I’ve been a huge fan of aubergine ever since I had my first ever aubergine parmigiana at Caputo’s, a family favourite (and sadly now gone) Italian restaurant in Chicago, when I was seven years old (credit to my parents for indoctrinating me to good food - and good restaurants - at a very early age). Ever since then I’ve loved aubergine and have always looked forward to summer when it’s at its best. Aubergine parmigiana is a bit ambitious for day to day cooking, but fortunately I’ve stumbled upon a few ways with aubergine that are simple but just as delicious, making it possible to enjoy this vegetable on a more regular basis. They also have the benefits of not using excessive amounts of olive oil, as many aubergine recipes seem to do. Baked aubergine is one of my favourites: slice the aubergine in half, slash the flesh and rub it with something tasty like pesto, salsa macha or chermoula. Even something as simple as olive oil, salt and pepper will do. Bake flesh-side up at 180C for 40 minutes or until the aubergine is absolutely soft. Turn this into a meal with simple sides like rocket salad, quinoa or bulgar wheat, a scatter of parsley or cilantro and a wedge of lemon. By far the simplest way to deal with eggplant is to bake or grill it whole then scoop out the insides and turn it into something yummy like Indian baingan bhartha or my latest eggplant revelation: Moutabal. 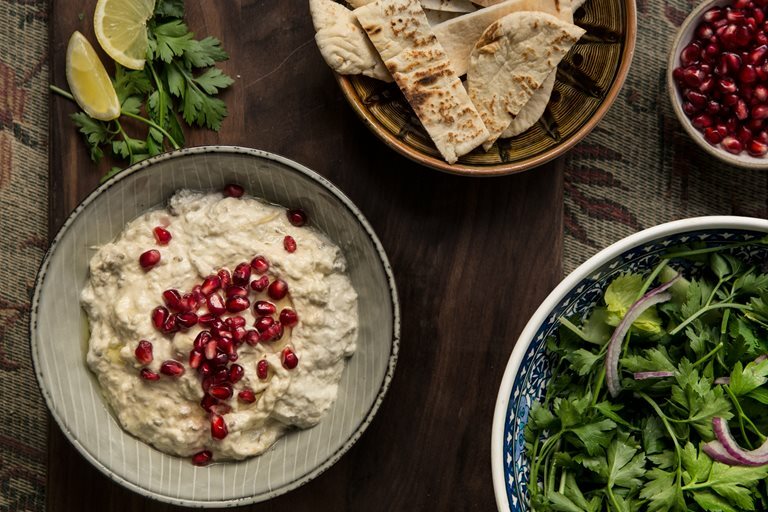 My friend Sharon (aka Genie Cooks) taught me how to make this Middle Eastern aubergine and tahini dip, very similar to baba ganoush. 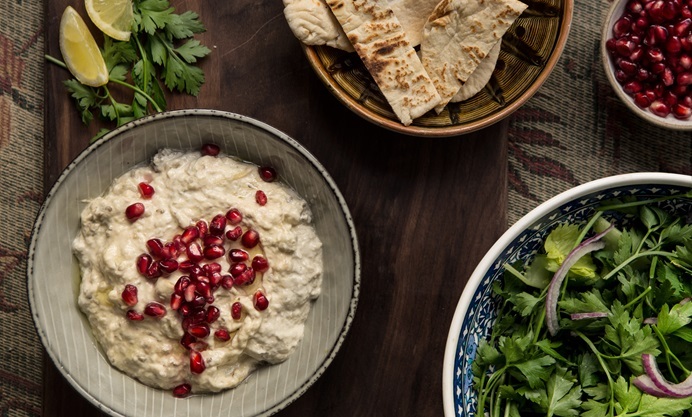 This is pure, creamy aubergine awesomeness, perfect for pita or flatbread and the kind of thing I want to eat all the time. Which is just as well because it’s extraordinarily easy to make.